We arrived around lunch time, at the airport, which is right at the lower levels of Santorini. 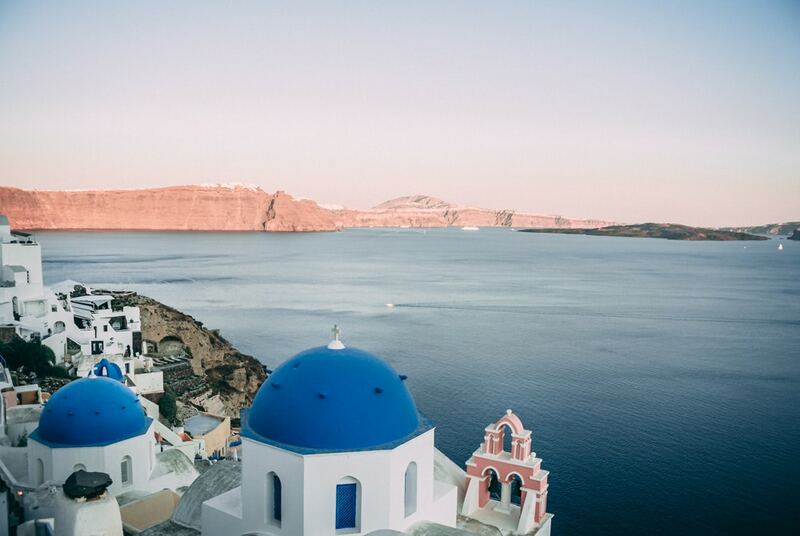 You will realise soon enough, that Santorini has many levels, most of which are high above the ocean. We left the airport headed straight for Oia, where we were staying. The high, windy cliff side roads with a steep drop kinda threw me. I hang onto Chris tighter than he would have liked until we made it safely to Oia, and immediately started pondering if there were other ways to get back out of Oia. Everyone else managed it fine, so don’t use my crazy fear of heights as a benchmark. We wasted no time and went straight out for lunch after exploring our little cave house. The views of the Caldera were even better than the pictures. The afternoon was spent exploring the village of Oia, taking in the views, and relaxing in our cave house away from the heat. As night fell, we got to see that Oia was just as beautiful at night. What a day! We thought we would try the walk from Oia to Fira early in the morning. The walk was amazing… but slightly longer than we thought. We started out, thinking we would get a bottle of water along the way and eat breakfast at the other end. Well it was about one and a half/two hours before we came across somewhere we could get a bottle of water. Water never tasted so good! Then we finally stopped for a delicious breakfast in Firostefani. With a little more energy we walked onto Fira and explored the village, before heading back to Oia (on bus). Looking back, this walk was probably one of the most amazing things we did in Santorini. The views, the landscape, the peacefulness. 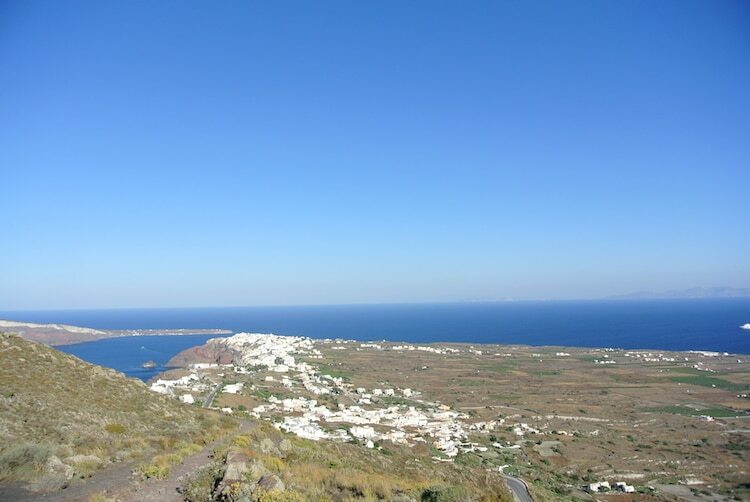 Walking from Oia to Fira was an unforgettable experience… and worked off a tiny bit of all the food I have been eating! We made the most of Oia, spending our day here. 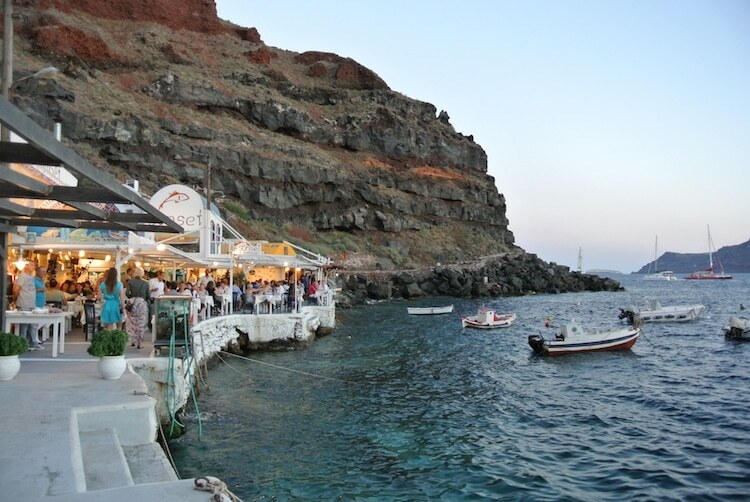 We finished the day with Dinner at Amoudi Bay, right on the water, enjoying a seafood meal. It’s pretty memorable. 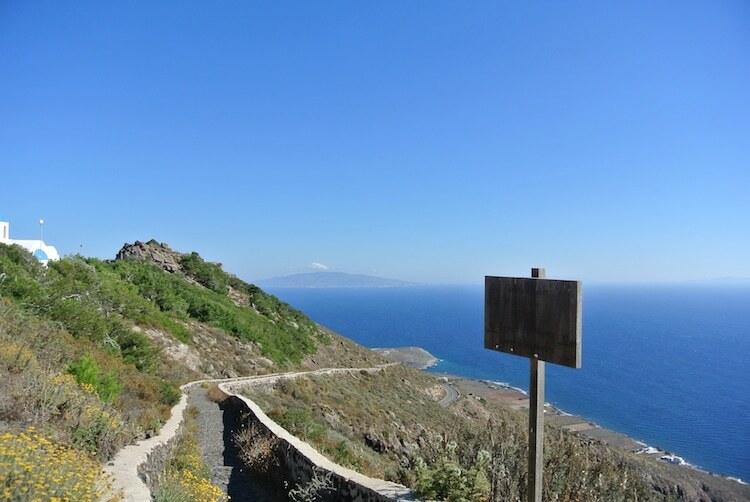 We walked down the many stairs from Oia to Amoudi Bay, and would recommend this (as long as you have good knees). Our final full day in Santorini. We hired a little red car and explored Santorini for the day. 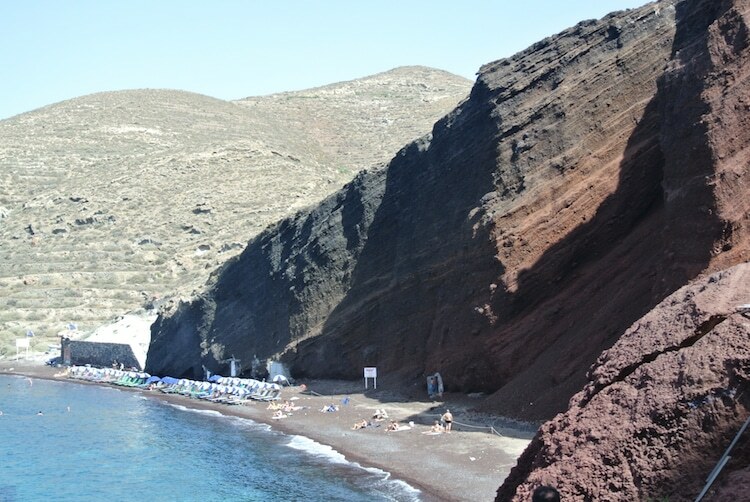 We were determined to find Santorini’s best beaches, so we checked out a few of the well known beaches and a few of the hidden ones. We tried to go to the Akrotiri Archaeological site… but there was a strike so it was shut. Maybe next time. Getting out in a car is a must if you want to see a bit of the island, it was mostly easy driving (except for the windy roads to/from Oia) and we found parking wherever we went. Driving around Santorini, from beach to beach was a pretty great way to spend the day. Length of Itinerary. 4 days in Santorini was a great amount of time. It gave us enough time to explore multiple areas, as well as relax. Of course you could spend more time, but I think 3 or 4 days would be a minimum. Choosing to stay in Oia. This could be seen as both a pro and a con. Oia was a beautiful village, great for sunsets, views, a little bit of shopping and restaurants. So it was definitely nice and relaxing staying here. But if you wanted to spend your days at the beach or be more central, than Oia might not be for you. We didn’t do a boat cruise around Santorini or to the neighbouring islands. I had heard so many great things about doing a short cruise around Santorini, but we also wanted to have some down-time here, so chose not to do it this time. Santorini has been in my bucket list for I don’t know how long. I think we will finally be taking a trip to Santorini in October of this year. This is a great itinerary. Thank you for sharing your experiences and tips. oh, how exciting, you will love it :) Thanks so much! Having just got married on Saturday 3rd September, we are now on Santorini for our Honeymoon of 10 nights. 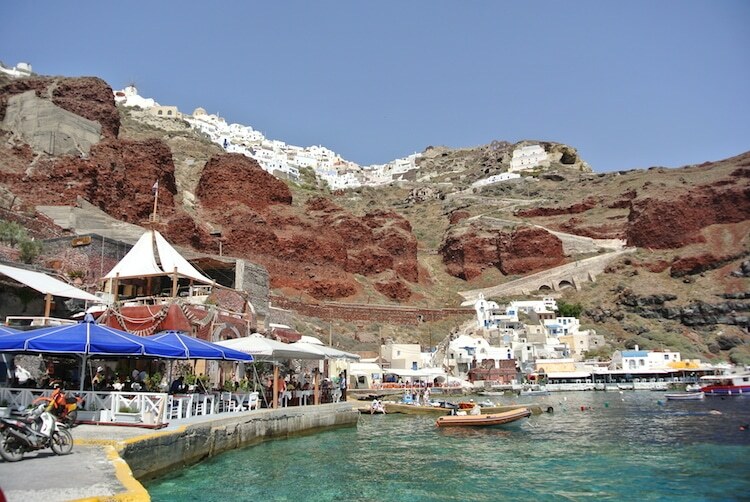 Staying at Marizan Caves in Oia, which is where you may have stayed? Having visited a number of Greek Islands over many years, this is my first time on Santorini. So far so good. The people are as friendly as ever, views stunning, fresh local food and fabulous September weather – 29c at 10am today. 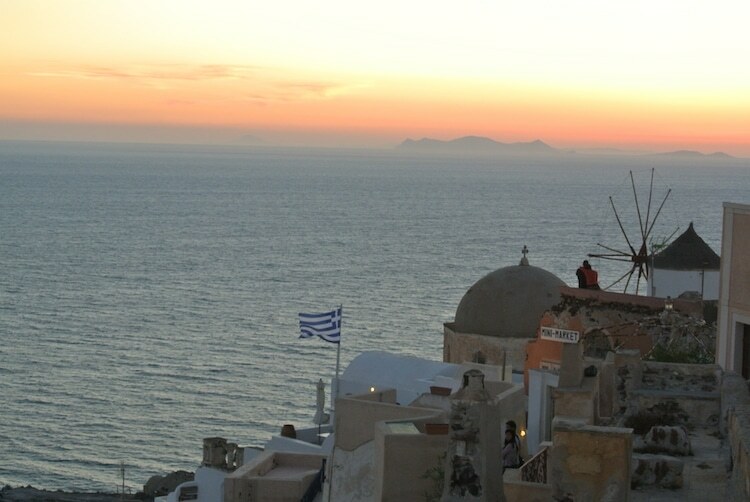 As for the famous Santorini sunset……it’s more stunning than pictures could ever portray. Planning on a few trips but mainly chilling out after a hectic few months wedding planning! A must visit destination if travelling around the Greek Islands. Thanks Google for putting you high! Hi! Thanks for sharing your itinerary! Lovely photos and videos! I was wondering if you still recall what was the name of the cave house you stayed at? 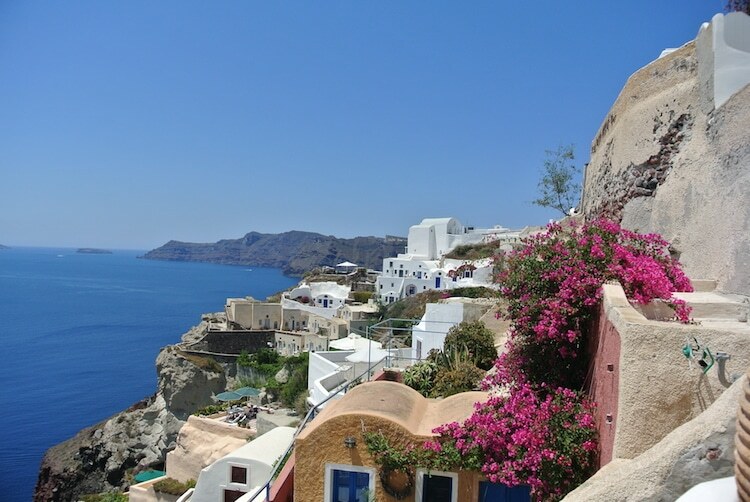 Hi Karen, thanks so much :) I don’t recall what the cave house was, just had a quick search and can’t find it either :( But there are so many beautiful cave houses in Oia to choose from. Have a great trip! Can you recommend any great spots to grab a bite / drink? Thanks for all you shared here. My daughter and her two friends, who are 18-20 years old, are considering going to Santorini for about 4 days. They want to lounge around, shop and experience a bit of nightlife. From your experience, is this the place for them? Do you have alternate suggestions from your travels in Greece? Thanks! j’ai eu l’occasion de visiter plusieurs regions en grece,c’est vraiment le paradis,sans ajouter aucun commentaire…bravo Anastasia. My wife and I are traveling in south Italy and Sicily in April 2015. We plan on flying from Palermo to Santorini (via Rome,Athens then Santorini) We will stay there for 3 night. We would like to visit another island for 3 more night then back to Athens 2 nights before we head back to the US.Any suggestions on the island we should consider to visit? I like Rhodes but I’m concerned it is further from Athens. Thanks for getting in touch! Sounds like you have an amazing trip planned. Sicily is a place I would love to visit. As for the Greek Islands, did you have any preferences e.g. small, quiet island, busier island with more to do, nice beaches, history etc? I loved Rhodes as it had a great mix of history, beaches and things to do. 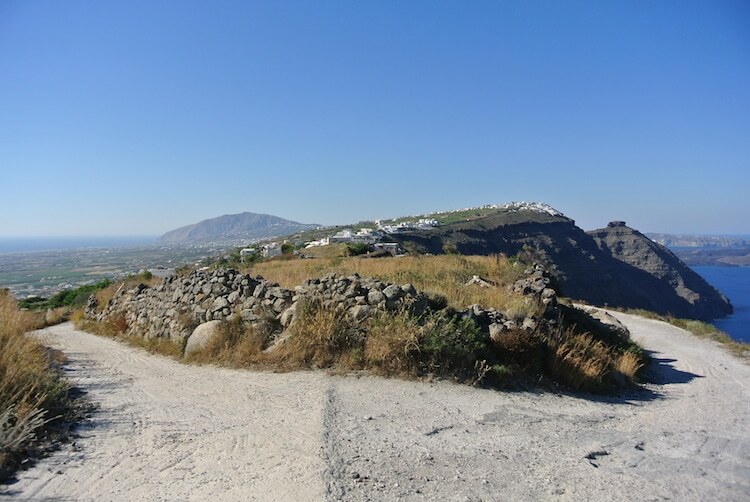 I had a quick look online at Aegean Airlines, and although you have to fly through Athens first, you can still get to Rhodes from Santorini in as little as 2.5 hours including layover time. 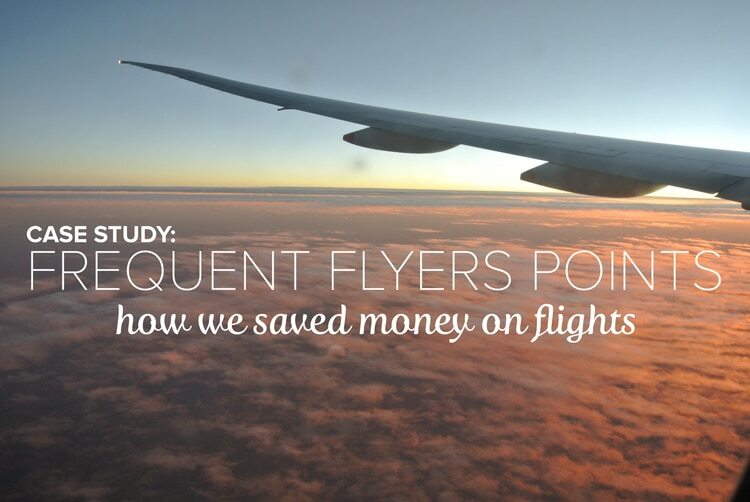 It does, however, add another two flights to your itinerary. There are overnight ferries, but the schedule for April is not yet out, and they only run every few days. So if you don’t mind the flights, I think you will love Rhodes. Otherwise I would suggest staying in the Cyclades. We visited Mykonos and I was pleasantly surprised. Hired a car for the day, drove to more remote areas and lot’s of beautiful beaches. I enjoyed getting lost in the streets of Mykonos town. And this is what I found when we were planning our trip: Naxos is one of the biggest islands in the cyclades, and seems to offer a little bit of everything. Or for smaller, more secluded islands perhaps try Milos, Folegrandos or Serifos.